The BMW i3 premium electric car, BMW's first attempt at production EV's after a few years of prototype electric cars, has begun production ahead of starting deliveries to customers in November. BMW's first production all electric car, the BMW i3, came a step closer to reality yesterday when the company began "serial production" ahead of first deliveries to customers in Europe starting in November. Not only is this BMW's first production EV, the company claims to be making history in other words, such as claiming the BMW i3 is the first premium electric vehicle purpose-designed for electric drive, and that ground-breaking technologies allow BMW to lay claim to a far more sustainable manufacturing process. We think that Tesla Motors may want to quibble about whether the i3 is the first purpose-designed premium electric car, but their manufacturing process has some interesting sustainability aspects to it. A key part of the BMW i3 design is the use of carbon fiber reinforced plastic (CFRP) for major body structures like the passenger compartment skeleton. Carbon fiber has always been very expensive, limiting its use to high value vehicles like jetliners, space ships, and race cars. Carbon fiber is attractive because it is ultra low weight while being extremely strong, but the prohibitive cost has kept it from being used in mass production vehicles. BMW developed a production process to mass-manufacture CFRP materials. That process begins with Mitsubishi Rayon-SGL Precursor Co. Ltd. in Otake, Japan, who then ships material to the SGL Automotive Carbon Fibers factory in Moses Lake, Washington where the material is worked to become carbon fibers, and finally those fibers are shipped to BMW factories in Germany to create body parts. Using CFRP materials means the i3 uses less energy to perform its task than if it were made of steel or even aluminum. By industrializing the CFRP manufacturing process, the BMW Group has become the first company worldwide to use CFRP in viable large-scale vehicle production economically. 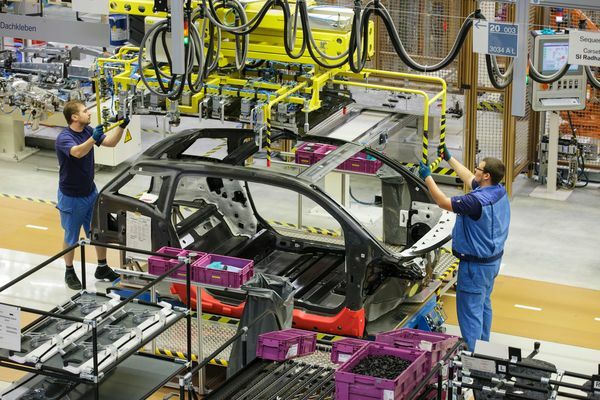 Other sustainable aspects of the BMW i3 manufacturing is the use of hydro-electric electricity to produce the CFRP, as well as water recycling, wind power and solar power at BMW's factories in Germany. The first BMW i3 off the line was earmarked to be the lead car for the International Berlin Marathon on 29 September, and delivered to German marathon runner Jan Fitschen. In the past, BMW developed two prototype electric cars, the Mini-E and ActiveE, to test customer acceptance and guide the design of not only the i3 but the BMW i8 plug-in hybrid sports car that's also due to start deliveries soon.